Hey friends! Being real right now. I’ve said it before and I’ll say it again…I don’t watch many sports. Ok, I maaaaay watch figure skating during the Olympics and there was this *one* time I got a little excited when the Toronto Maple Leafs were in the playoffs (yeah, that was a let down), but on the norm, I’m not a sports watching girl. The food that goes along with it, though? I will happily put on ma little game day face. Heck, I’ll even wear a ‘GO TEAM’ shirt…..*if* you feed me. Chunky Black Bean and Corn Salsa from me (Girl Heart Food) – If you have 10 minutes, you can whip up these easy salsa recipe. It’s on the healthier side, too, so you can balance out more of those indulgent eats. Vegan Buffalo Cauliflower Dip from Veggies Don’t Bite (pictured below & photo credit) – Such a yummy change up from traditional buffalo chicken dip. Using one of my fave veggies, cauliflower, this vegan buffalo dip will surely disappear fast at any party. White Bean Dip with Pesto and Sun-Dried Tomatoes from Umami Girl (pictured below & photo credit) – This tasty dip comes together quickly and is great for entertaining. Serve with veggies and chips for dipping, or bread for spreading. Spicy Feta Dip from Tasty Ever After (pictured below & photo credit) – This Greek Spicy Feta Dip Recipe is made with feta cheese and spicy peppers. It’s a tasty addition to any cheese board or game day party. Beet and Bean Dip from Savory Spin (pictured below & photo credit) – A dairy free, gluten free, spiced dip made with almond oil, beans, and, of course, beets! Plus, isn’t that colour absolutely gorgeous? Greek Seven Layer Dip Recipe from A Fork’s Tale (pictured below & photo credit) – 7 layers of deliciousness with this Greek flavoured layered dip. What’s your favourite layer? Vegan Nacho Cheese Sauce from Vegan Blueberry (pictured below & photo credit) – This quick and easy Vegan Nacho Cheese is the ultimate comfort food made in just a few minutes! It has a simple cashew-base and a few simple add-ins like Miso-paste and apple cider vinegar and is oh so cheese-like. 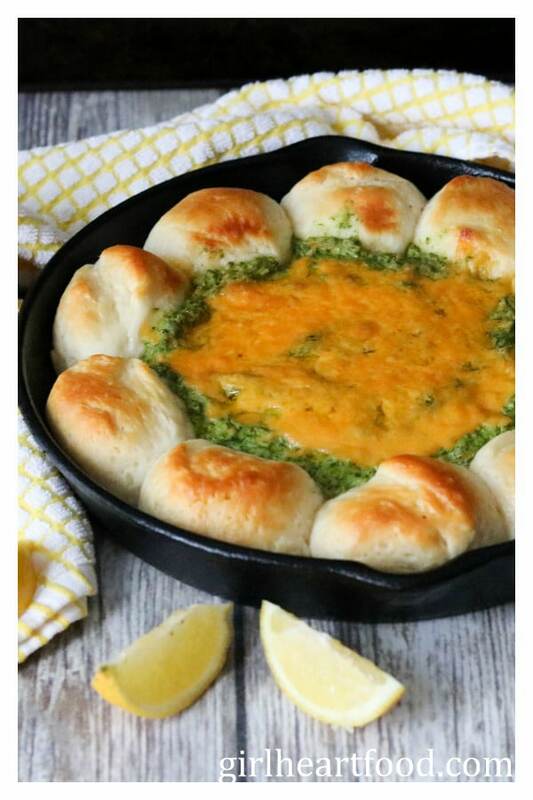 Spinach Artichoke Dip from me (Girl Heart Food) – This spinach artichoke dip recipe is baked right in a cast iron skillet with bread buns for dunkin’. Rather chips? That’s a-ok too! Pepperoni Pizza Dip with Cream Cheese from Delicious on a Dime (pictured below & photo credit) – This Pepperoni Pizza Dip is the perfect appetizer for a party or potluck when you want to please everyone. It’s hot, easy, cheesy, delicious and gluten free. Jalapeño Popper Dip from Go Go Go Gourmet (pictured below & photo credit) – With fresh jalapeños, cheddar cheese and bacon, this easy jalapeno popper dip recipe is the perfect appetizer for any party. Sweet Vidalia Onion Dip from The View from Great Island (pictured below & photo credit) – Sweet Vidalia Onion Dip is an easy hot appetizer that will disappear fast! It’s perfect for game nights, holiday entertaining, or a romantic night in (Valentine’s Day is just around the corner…just sayin’). Chorizo Cheese Dip with Spinach from Sunday Supper Movement (pictured below & photo credit) – Loaded with lots of spinach, spicy chorizo, and three types of cheese, this creamy dip is sure to be a hit at your game day party. Buffalo Shrimp Dip from Peas and Crayons (pictured below & photo credit) – Whether you’re partying it up with friends or whipping up a date-night spread at home, this easy cheesy Buffalo Shrimp Dip makes the perfect appetizer! It’s another yummy twist on the classic buffalo chicken dip. Philly Cheese Steak Dip from A Wicked Whisk (pictured below & photo credit) – Philly Cheese Steak Dip is the perfect hot appetizer twist to the classic Philly Cheese Steak sandwich. This yummy dip is easy to whip up and totally delish! Hot Reuben Dip from Baking with Mom (pictured below & photo credit) – You know that classic reuben sandwich that everyone loves? This is it in dip form! Hot and Cheesy Crab Dip from Lemon Blossoms (pictured below & photo credit) – Lump crab meat, cheese, lemon and dill are baked until bubbly and brown. This cheesy crab dip is scrumptious, rich, delicious and the ultimate party dip! Chicken Sausage Cheese Dip from Dude that Cookz (pictured below & photo credit) – Chicken sausage in an incredibly cheesy dip? Mmmmm……. Caramel Apple Dip from The Anthony Kitchen (pictured below & photo credit) – This caramel apple dip with cream cheese, salted caramel, and chocolate toffee is a must-have! It’s a great change up from savoury dips! Hope you find some yummy inspiration with these easy dip recipes for game day! Tell me, how do you like to celebrate? Are you a sport’s fan or just there for the food (like me)? This posts makes me so hungry I can’t stand it…now the only trouble is, which one to start with?? So so true 😉 Thanks Sue! I’m a huge sports fan, and not just for the food–but some delicious snacks never hurt the situation! I don’t even know where to start with this round-up. Good thing the Super Bowl is almost here, and then we’ll almost be into March Madness. I can sample all of them! You know I’m a big fan of my dips, Dawn!! Loving this roundup, and just in time for Super Bowl! It’s making me hungry though…I shouldn’t have scrolled through so late at night! Yow! All of these dips look EPIC! I could eat my weight in each one…especially anything buffalo chicken! YUM! I usually don’t get too into football because I get too involved and I basically have heart palpitations haha because I want my team to win so bad. So that’s why I need a dip like this to distract me! Oh, and maybe a glass (or two) of wine!! Thanks for this round-up, girly!! I hear ya, Haylie! I hear ya! Wine with dip sounds just perfect, if you ask me 😉 Thanks so much, my friend. Lol…too funny! That sounds like quite the plan 😉 Thanks David. This is definitely an epic dip line up Dawn! I love snacking year round, but I especially enjoy snacking during these cold winter months! And of course, these are also perfect for the super bowl. There are so many dips on the list that my husband and I would enjoy. Thanks for rounding them up! I agree! Always a good time for a snack 😉 Thanks so much Leanne. These all sound amazing! Thank you so much for including me! Great post to share before Super Bowl Dawn! One looks more delicious than the next! You’ve made game day entertaining so much easier! Thanks! What a fantastic collection of dip recipes! They all look so delicious – I think I may have a hard time choosing what to make first!! Love it!! I hear ya 😉 Thanks so much Kathy!